China has influenced the course of international development for thousands of years. 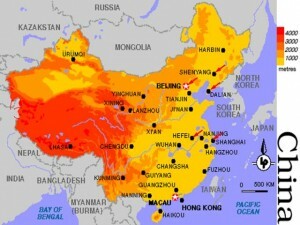 With more than 1.35 billion people, China accounts for roughly 20 percent of the total world population. After decades of rapid economic growth, China overtook Japan to become the world’s second largest economy in 2010. China’s international expansion, growing domestic market, raw material requirements, role as the world’s factory, and related environmental issues have far-reaching implications for people and development around the world. China stands at the head of the economic class of the original BRIC countries, which also include Brazil, Russia and India. After sustaining decades of annual GDP growth exceeding 10 percent, China overtook Japan in 2010 to become the world’s second largest economy behind the U.S.
China’s rapid economic growth and development is accompanied by the dramatic rise and growth of so-called mega-cities. People across China and other developing countries flock to cities in search of greater opportunity and higher living standards. The fruits of their labors and the economic advantages of cities’ financial, human and social capital help fuel development and urbanization. Over 70 percent of Chinese are expected to live in greater than 221 cities with populations over one million people by 2030, according to the McKinsey Global Institute. China’s history is the world’s history in many respects. With nearly 4,000 years of continuous history and culture, China is one of the world’s oldest civilizations. China has been the world’s greatest power for all but several hundred of the last two thousand years. Ancient China is credited with four of the world’s great inventions: paper, printing, gunpowder and the compass. Chinese society and culture is at once homogenous and incredibly diverse. Han Chinese make up the world’s largest ethnic group and about 92 percent of the population. While Mandarin Chinese, the main language, is spoken by more than 70 percent of the country’s people, China has anywhere from seven to thirteen main regional language groups and many other provincial dialects, which are often mutually unintelligible. The powerful, centrally controlled government and the Communist Party of China (CPC) hold defining influences over the country’s people, politics, development and foreign relations. Still, the country’s massive land area of 3.7 million sq. miles (9.6 million sq. km), many distant, locally governed provinces, and rapid economic growth create constant challenges for power and influence. Quiz – Chinese New Year!, Giant Panda Quiz!